Mark your calendars for our three annual signature events! Thanks to our volunteers and dozens of partner organizations across El Paso, we offer fun, FREE, exciting learning opportunities for the whole family. Water plays such a vital role in all our lives. Join us for music, dance performance by Ysleta del Sur Pueblo, food, arts & crafts, and award-winning short films that explore how water influences our lives. We encourage everyone to learn more about our water sources and our current and future water supplies. To know it is to love it! September 14, 2019 10 a.m. - 2 p.m.
Are you ready to immerse yourself in the scientific method? Science fair projects don't have to be stressful. 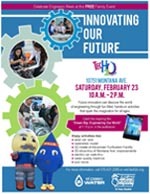 Come out and discover fun and exciting science fair projects ideas. Visit booths to learn how the scientific method was used in projects across many different science disciplines. Learn what makes a successful science fair project. February 23, 2019 10 a.m. - 2 p.m.
As part of National Engineers Week, we want to inspire students by celebrating engineers and hope that one day young people will also help to innovate our future. There will be many hands on demonstrations and projects designed to engage students of all ages in the wonders of engineering.